“Some time later, Jesus went up to Jerusalem for one of the Jewish festivals. Now there is in Jerusalem by the Sheep Gate a pool, in Hebrew called Bethesda, which has five roofed colonnades. In these lay a multitude of invalids—blind, lame, and paralyzed” (John 5:1-4). Both pools mentioned in the Gospel of John have now been identified – the Pool of Bethesda (John 5:2) and the Pool of Siloam. (John 9:7) The pool mentioned in chapter five turned out to have five colonnades (as described in the Gospel), but it was not structured as a pentagon. There were four colonnades separated in the middle by another one, thus forming the five colonnades just as the Gospel describes. There are several good reasons to think that this structure (situated right outside of the old city, but within walking distance from the Jerusalem Temple) was part of an Asclepion – a healing center dedicated to the Greco-Roman god of well-being and health, Asclepius. Devotion to Asclepius was widespread throughout the lands dominated by the Roman Empire. There were more than 400 Asclepions throughout empire, functioning as healing centers and dispensers of the god’s grace and mercy towards those in need. The god’s mythical daughters included the goddesses Hygeia and Panacea. We can hear in their Greek names our modern words for “hygiene” and “panacea” – key concepts associated today with medicine and health. 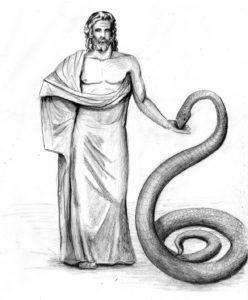 Snakes were a key component of Asclepius’s cult of health and healing. Even today, one of the key symbols of modern medicine is a pole with a snake wrapped around it. 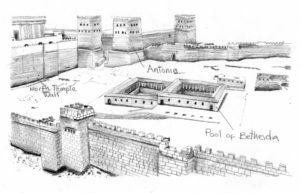 In that case, the pool of Bethesda (“house of mercy” in Hebrew) may not have been a Jewish site at all, but may rather have been a Greek Asclepion-affiliated facility. It is very important to notice that in the healing recorded in chapter five of John’s Gospel, Jesus does not command the one He healed to wash himself in the pool (of Bethesda), while in the story of the healing of the blind man in chapter nine, he did issue a direct command to go and wash at the pool of Siloam. (Jn. 9:6-7) It therefore appears that while the pool of Bethesda was a pagan place (an Asclepion), the pool of Siloam was indeed connected with the Jerusalem Temple. It seems that some Christian copyist, unfamiliar with cult of Asclepius and the Pool of Bethesda’s affiliation with it, added the explanation about an angel of the Lord stirring up the waters in an attempt to clarify things for his readers. All of our earliest manuscripts omit this verse. While trying to help his readers, the scribe unfortunately sent all subsequent generations of readers in the wrong interpretive direction, missing the whole point of the story. The stirring up of the water was part of a ceremony when the priests of the Asclepius temple opened the connecting pipes between the higher and the lower portions of the pool. Because one set of pipes was higher than the other, this caused a “stirring” of the water in the pool. The water in the upper reservoir would flow into the lower portion of the pool, but a 4-5 century Christian scribe would not know that. This is an excellent illustration of the importance of recapturing a first-century, Jewish perspective on the Scriptures.